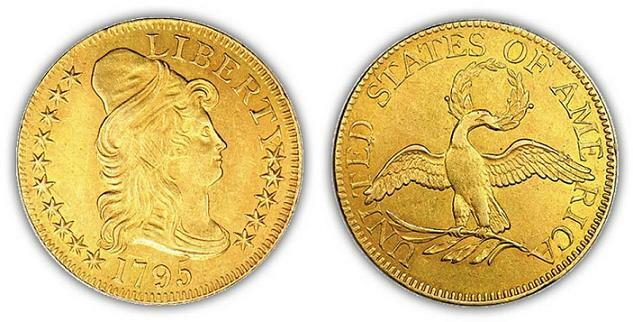 The first gold US coins, half eagles ($5) and eagles ($10), were issued by the United States Mint in 1795. This term when used in coin collecting describes a prototype of a proposed coin design. pieces only. Two varieties were made in 1877 and were called Half Unions. Specimens were struck in copper, and one of each variety was struck in gold. The two gold coins are now in the Smithsonian Institution and are regarded as national treasures. 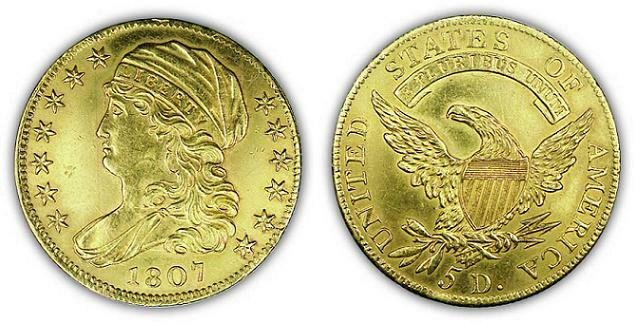 Since 1986, American Eagle Gold Bullion $50 One-ounce Coins have also been produced. Early gold US coins were made of 91.6% gold, with the remainder being copper and silver. Beginning in 1834, they were made of 90% gold and 10% copper. Executive Order 6102 made private ownership of gold illegal in the United States. Mintage figures are often meaningless when it comes to US gold coins, as many coins were surrendered to the United States Government and melted down when Executive Order 6102 was signed by President Roosevelt in 1933. A few coins managed to survive as they were either hidden away in illegal hoards or placed in bank vaults in South America and Europe. After the ban on owning gold was lifted in 1975, American Gold Coins began returning to the United States. Below you will find a list of the different Gold US Coins along with a brief introduction to each. The Quarter Eagle is a gold US coin authorized by the Act of April 2, 1792. The first issue was produced in 1796 with a weight of 67.5 grains and .9167 fineness. They were struck in several different types until 1907 with most dates before 1834 being rare. The Three-Dollar Gold Piece was authorized by the Act of February 21, 1853 and the first coin was produced in 1854. Coins or currency which must be accepted in payment of debt. and the Postal Service would only accept gold or silver coins as payment for stamps. The coin was not popular with the public and didn't see much circulation, however it was popular with collectors which is why numerous Mint State examples are fairly common today. An Indian Princess crowned with a circle of feathers adorns the obverse or front of the coin. The band of the headdress is inscribed with the word LIBERTY. The back of the coin depicts a wreath of tobacco, wheat, corn and cotton, with the denomination and the date within it. This term when used in coin collecting describes a prototype of a proposed coin design. coin that was proposed to Congress, along with several other patterns, as a possible coin for international commerce. Congress decided, however, that the Double Eagle with a $20 face value, already in use in international commerce, was more convenient than a denomination of $4 which didn't match any of the coin's European counterparts. 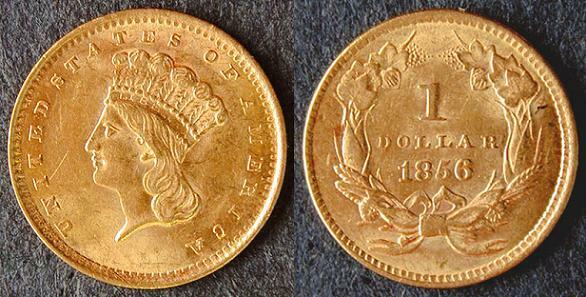 The Four-Dollar Gold Piece, or Stella, was never minted in quantities for circulation. There were two distinct types of four-dollar gold pieces, Flowing Hair and Coiled Hair, each issued for two years, 1879 and 1880. The coins with an 1879 date were made for congressmen to examine and the 1880 dates were made secretly by Mint officials and sold to private collectors. Both types of coins were struck as patterns in gold, aluminum, copper and white metal. Of the four varieties of Stellas produced, the most common is the 1879 Flowing Hair type. Between 300-400 of these coins are known to exist. The other three varieties are extremely rare with only a few coins of each known to exist. The Half Eagle is a $5 Gold US Coin that was authorized by the Act of April 2, 1792. It was the first gold coin actually struck for the United States. The Eagle is a $10 Gold US Coin that was authorized by the Act of April 2, 1792. It was produced by United States Mints from 1795 to 1933, except for the years 1805 to 1837. 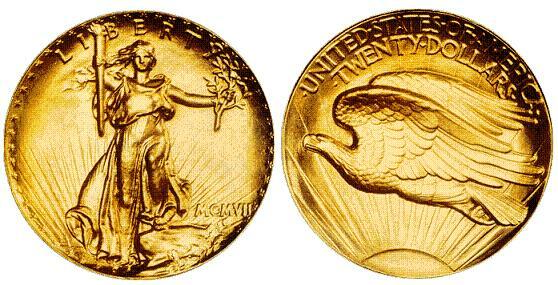 The $20 double eagle gold US coin was first minted as a pattern coin in 1849. The first coin produced for general circulation was made in 1850. Gold Bullion Coins are modern US gold coins also known as American Eagle Gold Coins that were authorized by the Bullion Coin Act of 1985. They were first produced by the United States Mint in 1986. If you want to get started with your own gold US coin collection, there are a couple of great books on the subject that also contain photographs of each type of gold coin made. They are A Guide Book of United States Coins , by R. S. Yeoman, or United States Coinage: A Study By Type , by Ron Guth and Jeff Garrett. For some great deals on U.S. Gold Coins and Coin Supplies visit my friends at Jake's Marketplace, Inc. They have a very comprehensive selection to choose from and give great discounts!